Han the Five Tails Jinchuriki is a shinobi from the Village Hidden by Rocks. Despite being one of the strongest Jinchuriki, he was captured and Five-Tails (Kakuo) was extracted by Akatsuki. Han [Five-Tails Jinchuriki] was reincarnated with Edo Tensei during the Fourth Shinobi World War. Taijutsu, Ninjutsu Five Mountain Jump [Prompt]: Cancels all Shields and Buffs from both fields. Use this skill again to cause damage to the opponent’s entire Lineup and Knockdown to a selected unit. Taijutsu Heel-Crush Attack: Attacks up to 3 opponents units in the front row and has a fixed chance of causing Knockdown to a targeted unit. Ninjutsu Steam Shield: High chances of evading a Standard Attack. Can be triggered once each round. Taijutsu Steel Leg Jet: Chases and Attacks a Low Floated unit, causes Knockdown. Ninjutsu Tailed Beast Chakra: Before the first action in a round, recovers Life points based on this unit’s Ninjutsu attribute. Becomes immune to Low Float, High Float, Repulse and Knockdown. 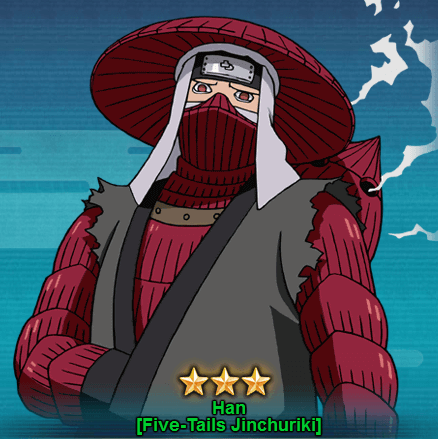 You can get Han [Five-Tails Jinchuriki] from the Jincurikki Treasure 2. It will take almost 180-220 seal scrolls draw to get Han.